Some sensible news coming out of the City of Naperville where the members of the City Council have formally decided to not allow future members of the City Council to participate in the Illinois Municipal Retirement Fund Pension program. It’s the end of the line for pension benefits for Naperville City Council members. Members of the council last week deleted pensions from the list of benefits they receive and amended the city code to reflect the change. As of March 4, council members no longer are eligible to participate in the Illinois Municipal Retirement Fund. ...Future council members cannot contribute to or receive benefits from IMRF because a resolution passed Tuesday says their position no longer requires enough work each year to be eligible. If pension obligations are already our biggest problem when it comes to government finances, this is asmall, but smart step that we here at the Truth Team would like to see followed by other local units of government. Good for you, Naperville. The news coming out of DuPage County is getting better. 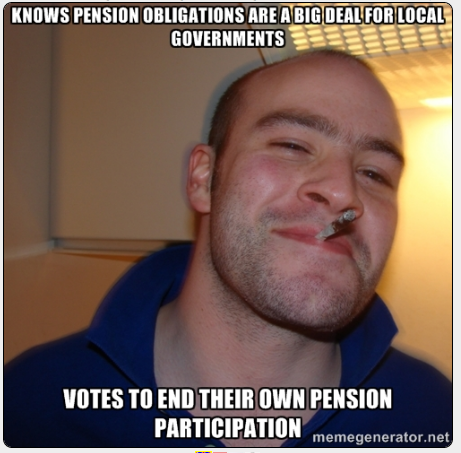 First it was Dan Cronin eliminating a unit of government, now it is pensions going away for elected officials.